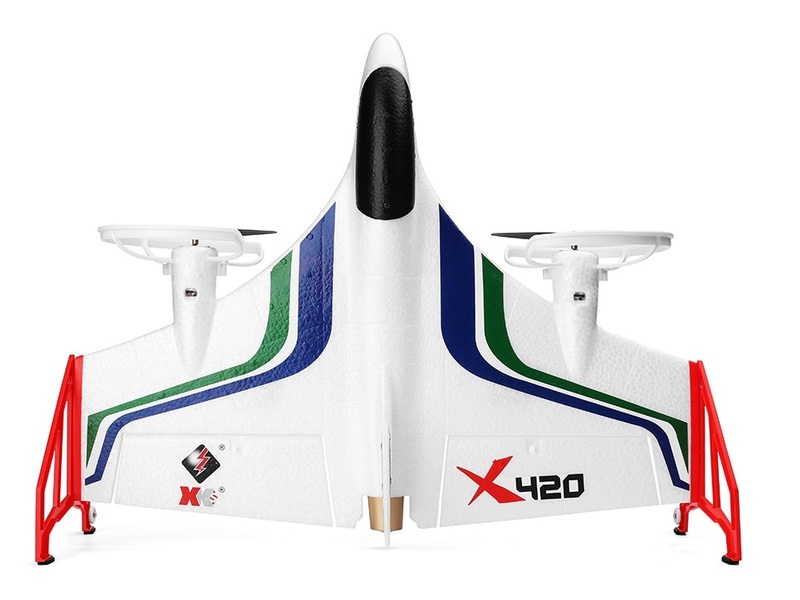 The X420 is a cross between a plane and a multicopter. You can take off and hover like a helicopter would, but then flip the switch and fly it like a plane. It comes with everything included to get flying apart from normal AA batteries for the transmitter. 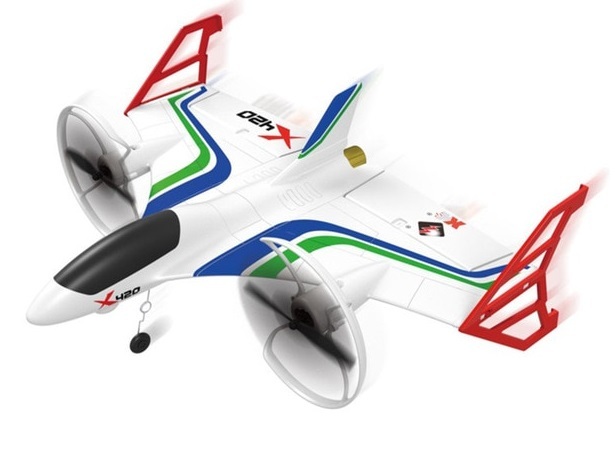 The WL X420 is a fun model that has strong twin motors and Li-Po battery giving lots of power to perform amazing aerial stunts in plane mode and easy vertical take off in hover mode. It's extra useful if you don't have a large area to take off from like you would need with a traditional plane. The plane can also take off and land as a normal aircraft if you prefer. The X420 is perfect for both beginners and experienced pilots with a 6 axis gyro auto-pilot system making flight easier and more stable for newer fliers. With the 6G mode turned on extreme pitch or roll angles are prevented allowing you to get to grips with the controls without risking a crash. The second mode, 3D, removes those restrictions giving you ultimate control and unlocking the full power of the plane. In 3D mode, the aircraft is capable of crazy stunts such as loops and rolls. It has the ability to hold altitude in both flight modes keeps the aircraft flying if the pilot gets into difficulty. The plane is RTF (ready to fly) meaning that everything is included with only very minor assembly needed. 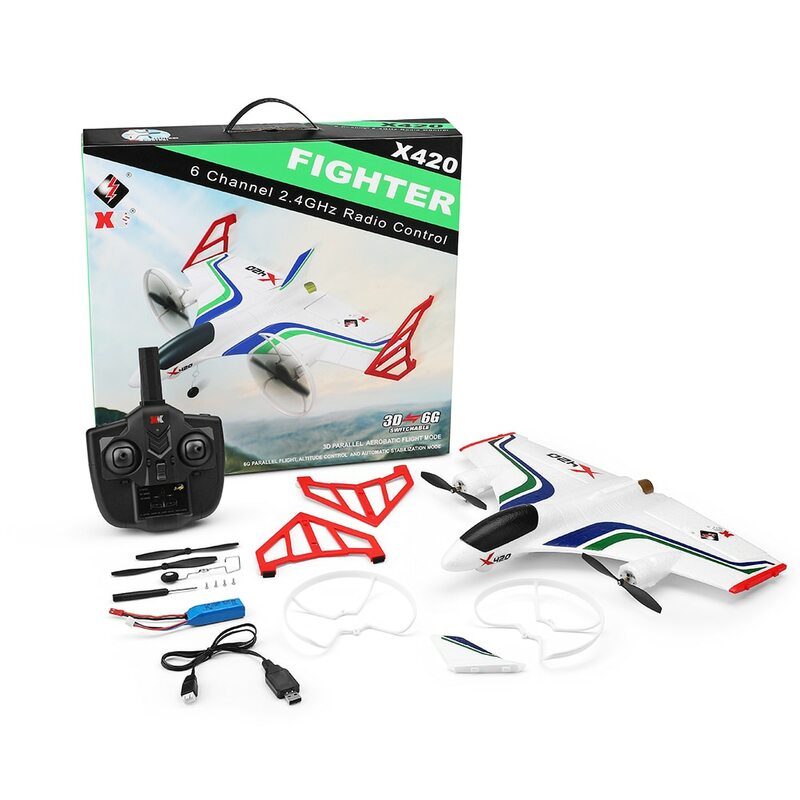 Light weight and extremely durable EPP airframe ideal for stunts and aerobatics in 3D mode. The x420, transmitter, battery, USB charger, spare blades & manual. Can take off and land vertically in small areas or normally. Multirotor versatility with sport plane agility. Light weight and extremely durable EPP airframe. Twin 050 motors with LiPo battery can send this skyward vertically like a rocket. 6-axis gyroscope autopilot with 3D or 6G mode selector. Switch to 3D mode for full aerobatic control or switch on the 6 axis gyroscope for easier control for beginners to practice flight. Altitude hold feature in both flight modes keeps the aircraft flying if the pilot gets into difficulty. 1) Indoor vertical flight - The aircraft can fly like a four-axis quadcopter with vertical flight, hover, forward, backward, left / right, spin. One key auto take off and landing when in vertical mode. 2) Outdoor mode - The aircraft takes off vertically from one key switch. The aircraft will climb 3 meters and then change to horizontal flight mode automatically (6G self-stabilizing mode). 3) Outdoor stunt mode - When flying horizontally switching the 3D/6G key puts the aircraft into 3D stunt mode (3D lock mode). In this mode it's easy to perform somersaults, rolls, death spirals, and other stunts. If you are in trouble with 3D mode, switching back to 6G or vertical mode should save your aircraft. Three point landing gear can be used for normal aircraft glide landing or outdoor glide takeoff to get directly into the fixed wing mode. High-capacity 7.4V Li-po battery giving a flight time of between 8 to 10 minutes. Wing end fins and tail clip into position so easy to assemble and disassemble for storage.